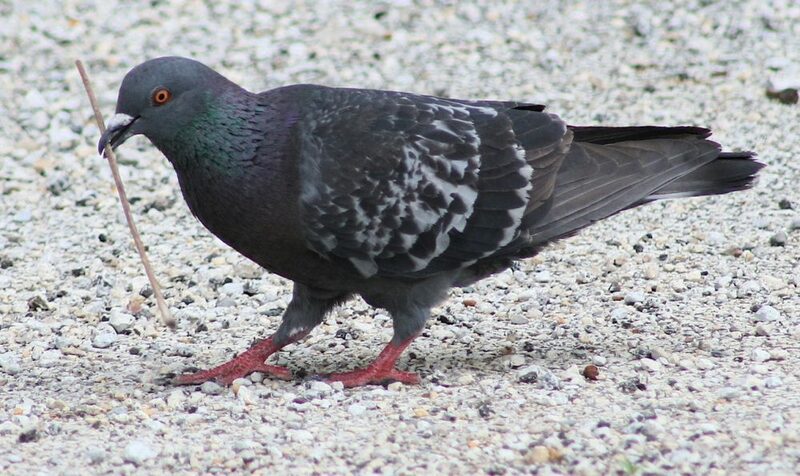 Pigeons are highly variable in color. The rock dove, commonly called pigeon, is a large dove, weighing nine to thirteen ounces. They are typically 11 to 14 inches in length with a wingspan of 20 to 26 inches. Wild pigeons are gray birds with two dark wing bands, but coloration is highly variable. Pigeons often have iridescent, bluish, purplish, chestnut, white or tan feathers. Pigeons that escape from breeders have a variety of plumages, and these birds will sometimes join and breed with wild pigeons. Check out the Cornell Lab of Ornithology All About Birds website on rock pigeons for audio clips, ID info and life history. The pigeon was introduced into the United States in the early 1600s. They are a permanent, non-migratory resident in Illinois. Pigeons are common and abundant throughout Illinois. Pigeons often gather in flocks of 10 to 30 birds. Multiple groups of flocks occur in areas such as parks where people regularly feed birds. Pigeons spend considerable time foraging on the ground for seeds. When roosting, they prefer sites such as the undersides of bridges or flat window ledges. Pigeons are strong fliers and hold their wings in a V shape when gliding. Pigeons are an important food source for urban-dwelling peregrine falcons (Falco peregrinus). Pigeons may spread diseases to people through their droppings. They can be carriers of toxoplasmosis and salmonellosis, and their droppings can harbor the spores that cause histoplasmosis. Pigeons are found in urban, suburban and agricultural areas. They tend to congregate around man-made structures such as city buildings with ledges, church steeples, bridges, farm buildings and grain elevators. In natural areas, they can be found near rocky cliffs. Pigeons primarily feed on seeds and grains but will also consume insects. Pigeons build flimsy nest platforms of sticks and straw, and often build their nests on the ledges of buildings, bridges, towers and other structures. They have four to five broods per year, laying one or two white eggs per brood. The eggs are incubated for 16 to 19 days. Pigeons feed their chicks a nutrient-rich liquid from glands in the adult’s crop. Both the male and female feed the young. Chicks are ready to fledge the nest when they are 25 to 32 days old. Pigeons can live for three to five years in the wild. 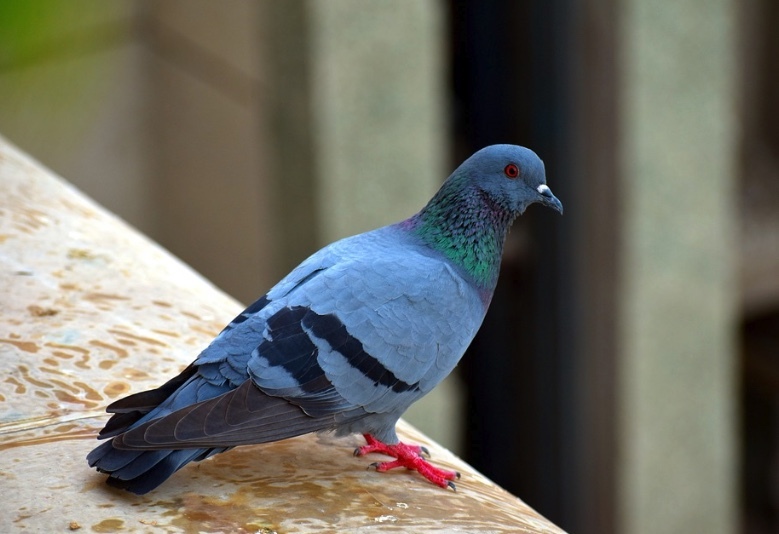 If large deposits of pigeon droppings are left undisturbed, they can cause deterioration of building and automobile paint, kill vegetation and pose a health hazard. The best way to control pigeon populations is through the removal of food, water, and nesting and roosting sites. Do not feed pigeons. Properly dispose of garbage and clean up grain spills around railroad yards. Eliminate standing pools of water. Eliminate potential nesting and roosting sites by installing ledge protectors (commercially available strips of protruding metal spikes) or use building materials to change the angle of the ledge to 45 degrees or more. Ornamental architecture can be screened with one-inch mesh netting. In new construction, eliminate ledges or build them at an angle greater than 45 degrees. Tactile (sticky) repellents are not recommended. Other birds may come into contact with the repellent, which may impair their ability to fly or stay warm if the product comes into contact with their feathers. Frightening devices such as Mylar tape, eyespot balloons, bird of prey forms and noise-making devices are not very effective in deterring pigeons from using an area, since they quickly become accustomed to the devices. Therefore, frightening devices are not considered a viable long-term solution for pigeon control. In residential areas, trapping and removal of pigeons is best conducted by a professional nuisance wildlife control operator licensed to remove birds. 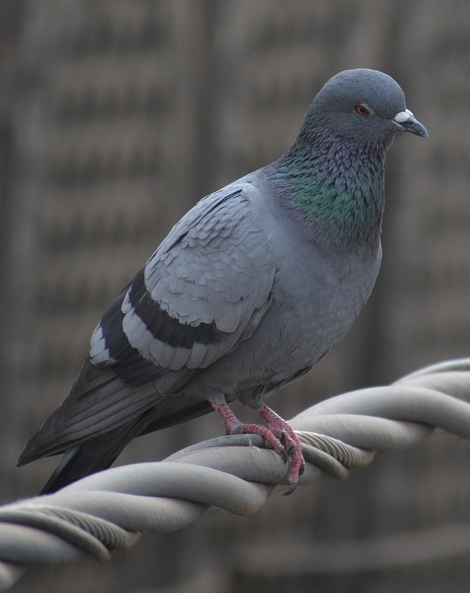 For assistance with large pigeon populations in urban areas contact the United States Department of Agriculture Animal and Plant Health Inspection Service Wildlife Services (USDA APHIS-WS) at (217) 241-6700 or toll free at 1-866-4USDAWS. Pigeons are an introduced species in North America and are not protected by the Migratory Bird Treaty Act or the Illinois Wildlife Code. A permit is not needed to remove pigeons, their nests or their young. However, the removal technique used to remove the pigeons must not pose a threat to native bird species that may be nearby.